LANCASTER, Pa. (AP) — Let’s get the obvious questions about camel’s milk out of the way first. It tastes like skim milk, just a wee bit saltier. And with regard to how you milk a camel: Very carefully, it turns out. Camel’s milk has arrived in Lancaster County, courtesy of Little Bit, Twila and their herd, who can be seen grazing placidly in a pasture on an Amish farm in Upper Leacock Township. A local Amish organic cooperative is operating a camel dairy here, milking the long-legged, one-humped animals twice a day. Miller’s Organic Farm ships the milk all over the United States and even into Canada, for $10 a pint. 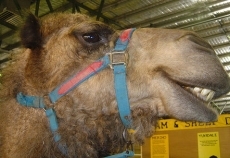 It has about 100 customers who regularly buy camel’s milk. Miller’s is one of about a half a dozen camel dairies in the nation, operating in states including Missouri, Michigan and Indiana. Like Miller’s, many of the dairies are operated by Plain Sect farmers. The animals can be a bit choosy and a bit stingy with their milk, says a Miller’s employee, Ben Stoltzfus. Camels only can be milked while they are nursing a baby and they only will give up so much of their milk in a session, he says. So how does an ice cold glass of camel milk sound? I would like to watch the milking session. A glass of milk? No, thank you! Interesting article! After you have been milking the camels all week long it brings a whole new meaning to “hump day”, huh? I suppose any animal with an udder can be milked. Not sure about drinking camel’s milk but I regularly drink goat’s milk. I say, fair play to them. If there’s a market in it then why not? Think I’ll stick with Elsie the Cow’s milk. Humans will drink any milk but human milk. Go figure. I drink no animals milk myself and the thought of drinking any animals milk is disgusting. Yek!!! Sure I would drink camel’s milk. I drink milk from a cow or a goat and would consider trying sheep’s milk so why not? I have had breastmilk as a young child (until 20 months) and I have tried a drop or two from my fingers when breastfeeding my daughter. I really do not see human milk as yucky. The article says the camel’s milk is shipped all over the U.S. A few years ago, an Amish dairy farmer got in trouble with the Feds for selling cow’s milk across state lines( some sort of ridiculous prohibition on doing that). So why is camel’s milk permitted to be sold in the same way? Oh boy.. Not for me, thank you! Im not a milk drinker.. I use it in cooking occasionally but I’ll probably only drink one 8 oz glass of milk in a year..
Now you got me thinking…there was (not sure if it still exists) a llama farm a few miles up the road about 10 years ago. Does anyone know if there’s a market for llama milk? Or what IT tastes like? I’ve heard it mentioned that goat’s milk is good for colicky babies (my month old granddaughter is colicky, unfortunately). Does anyone have experience with it? I’m guessing camel milk is GREAT for camel babies, but I’ll stick with cow’s milk (I drank milk at every meal through my 20’s, into my early 30’s). OldKat, you crack me up! Yes, EVERY day is “hump day” at a camel dairy! Good question Katrina, the article does not address that. Most of the customers who buy camel’s milk are parents of children with autism. Miller’s has sent the milk to a school for autistic children in Vancouver, Canada, as well as parents in California and other states. Customers have told Stoltzfus they have noticed an improvement in their autistic child’s vocabulary due to the milk, and others have said the milk has helped with diabetes. But he is hesitant to say the milk has curative properties. Ok ERik- now you really have aroused my curiousity!!!! I’m going to search the web for camel’s milk and autism and see what’s being reported. I have family members with autism and the school I teach at has an autism program, as do many other schools. About half the article is about that aspect of it Katrina, so you might want to check that out too. With 100 customers at $10/pint, this seems like it could be a pretty good business, depending how often they are ordering the milk…and depending how much patience you have for camels. I wonder how much this article will be worth to the business…will it double their customer base? Triple it? There are camels in Indiana also. A farm located between Shipshewana and Middlebury right alongside the Pumpkinvine Bike Trail, has about 6-8 of them. One time 2 females were right up alongside the trail(on the otherside of the fence of course) & we got great photos! Deb I’m going to have to see if I can find these camels by the bike trail….. I live right at the bike trail crosses 900w in Shipshewana…..didn’t know there were camels so close. animal sanctuary near Albion? I was there a few years ago. They have all kinds of animals retired from circuses and those wild animals that people were keeping as “pets”- including the lion that was being kept in an NYC apartment. I believe it was called “Black Pines Animal Sanctuary”. They have a website, too. After my original post, I thought of another question. I womder if camel’s milk can be used in baking? If so, would there be a taste difference in the baked product? Don’t mean to gross anyone out, but I think out of the box a lot. If it weren’t July 16th, I’d swear you were pulling an April 1st joke on us! I’ll stick with bovine beverages, thanks! Michigan Mary I almost started this post with an April Fool’s reference. I’m somehow not surprised there are Amish involved in this. It’s funny how Amish are described sometimes as bound by tradition yet they seem to get into these unconventional markets in business. Wow! I had no clue. I would like to see an article on Amish and llamas/vicunas. Somewhere I read that there were Amish who had such animals–especially the llamas that are very easy to raise/keep (they do their doo-doo droppings in just one place, I read). Anyway llama fur is supposedly great for yarns. ?????????????? How many Amish keep goats as against dairy herd of cows? An Amish fellow I met in Indiana years ago sold goat meat (mainly I believe to Latino, as well as Muslim customers, who use it in their respective cuisines), but that would be a niche business. Marybeth You are really closeby. I think I remember seeing the Cheese Haus in the distance off to the south. They are definitely closer to Shipshewana than Middlebury, on the south side of the trail. I just looked at Google Earth and maybe the farm is on 1100W. It looks like the right area. An Amish family near Turbotville PA has milked camels for about two years. There have been a few auto accidents on the road in front of that farm, as motorists catch sight of the camels and crane backward to take a second look. People all over the world have drunk camel’s milk and yak’s milk for as long as we’ve been able to domesticate them. From what I know, goat’s milk is more easily digestible because the fat globules are smaller…it contains more medium chain triglycerides. Also, goat’s milk has considerably less lactose in it than cow’s milk. Neither human milk or goat’s milk has the alpha S1 casein protein found in cow’s milk…the protein that is an allergen to so many. When I was in high school, which was, ahhh … MANY years ago there was a girl that was two years behind me in school, and whose family had a fairly large herd of milking goats. Can’t recall the breed, but they had a bunch of them. One time our high school Vo. Ag. teacher took us out to their place for a field trip and her dad was talking about how people that couldn’t drink cows milk could drink goats milk. I never bothered to look up why this is so, but now I know! You know, you can learn the darndest things on Amish America! Thanks for that Sandra, I’ve often wondered why I was intolerant to cows’ milk but not goats’. I take lactase capsules for when I’m out and about or around friends’ homes so that I can eat/drink without causing any fuss. After reading all these comments I really want to try camels’ milk. My father came from Egypt so I suppose some of my ancestors would have drunk it at some stage. I haven’t seen a baby formula made from goats’ milk, but I think it would be a real boon! Well what can i say !! Guess they drink it in the dessert, Nomads i mean , but you learn something new everyday :-). I have never understood how somebody would gladly drink the milk of one non-human species, but be disgusted at the thought of drinking the milk of another. Adds a whole new meaning to “hump day.” Sorry I couldn’t resist.